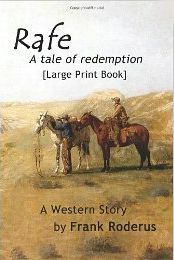 Published by ThreeSixteen Press, RAFE is now available from Amazon, Barnes and Noble, etc. Rafer Allard was a bank robber. A very good bank robber. It was a career choice that greatly pleased him and his every intention was to keep it up for as long as he could run to a horse and spur it away. That was until a late afternoon in Tumer, Kansas, when two bullets in the back and a man named Peter Stone irrevocably changed his life forever. 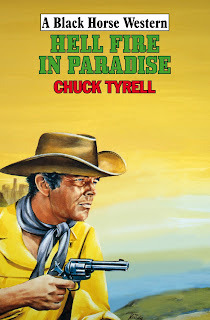 HELLFIRE IN PARADISE is the latest Black Horse Western from WF member Charles Whipple, writing under the Chuck Tyrell pseudonym. It opens by piling tragedy upon tragedy on the head of its heroine, Laurel Baker. The ranch house she shares with her husband and two young sons in Arizona’s Paradise Valley burns down, killing the two boys, and that same night Laurel’s husband Jack dies when the wagon he’s driving is forced into Paradise Gulch. These losses are almost too much for Laurel to bear, but when it quickly becomes obvious that these tragedies aren’t accidents or coincidences, Laurel’s strong-willed nature asserts itself and she digs in her heels and picks up a Winchester, refusing to budged from the Rafter P ranch. She winds up getting some help along the way, but Laurel is plenty tough in her own right, as Whipple makes clear in this fast-moving, well-written novel. Most of the Black Horse Westerns are solid traditional Western stories with good characters, and HELLFIRE IN PARADISE is a prime example of that.